The charms of St. Lucia begin with the island's dramatic scenery, from the twin Pitons -– the island's conical seaside mountains –- to a simmering volcano and lush rainforest. Scattered resorts cling to hillsides and protected coves while locals provide a warm welcome to guests from around the world. St. Lucia is far from overdeveloped, although more hotels are being built all the time. Location: Between the Caribbean Sea and the Atlantic, north of Trinidad and Tobago. Currency: Eastern Caribbean Dollar; U.S. dollar widely accepted. Weather: Dry season January-April; rainy season May-August. A "drive-through" volcano may sound cheesy, but it's actually a fascinating experience; just make sure the tires on your car don't start to melt! Hiking opportunities abound in St. Lucia's rainforest, but perhaps the most unique vistas are from a zipline through the trees. The twin Pitons offer challenges to fit hikers as well as a stunning backdrop to the island's great beaches, many of which have great scuba and snorkeling just offshore. The black sand on many of St. Lucia's beaches is a reminder of the island's volcanic past, but St. Lucia also has beautiful white-sand beaches, too. This 'best-of-both-worlds' appeal follows through whether you're in the water or out: the island has placid coves and strands where the surf can range from rough to dangerously forbidding. Resorts, restaurants and rum shops line beaches like Reduit, but you can also find seclusion at the palm-shaded Anse Chastanet cove. 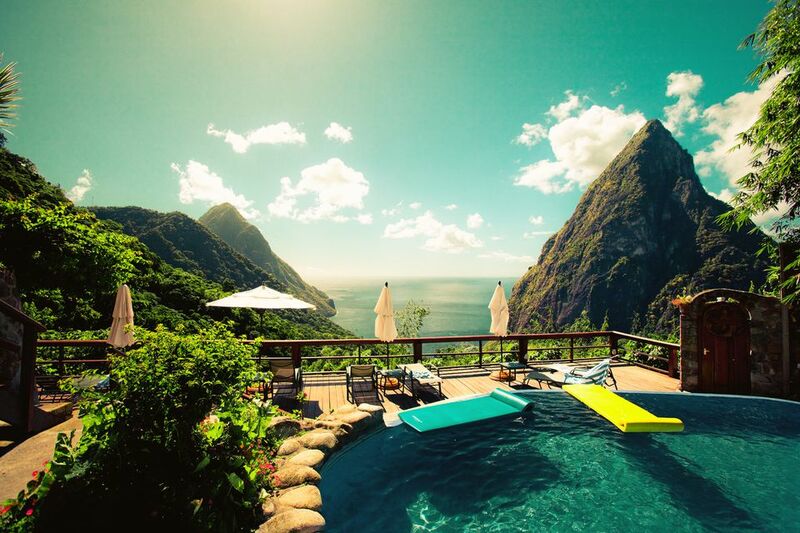 Luxury resorts abound on St. Lucia, from the Jalousie Plantation and Anse Chastanet with their beautiful beaches and Pitons views to Ladera, voted Conde Nast's best Caribbean resorts. All-inclusives also are popular, from the well-known Sandals Halcyon and Regency resorts to the eco-friendly Discovery at Marigot Bay. A number of former plantation homes have been converted to small hotels and inns, and the island is dotted with private homes and villas that are available to rent. St. Lucia's restaurants are famed for their spicy Creole cuisine, from curry goat to East Indian inspired 'roti's and an abundance of roasted or fried local seafood, including spiny lobster. Many of the best restaurants are at the upscale hotels, like Dasheene at Ladera, but you'll also find excellent eateries at Vigie Marina in Castries and even in some of the island's shopping centers, like the Gablewoods Shopping Mall. St. Lucia's original inhabitants were the Arawak Indians, later displaced by the Caribs. The French first colonized the island in the mid-16th century, but the island changed hands more than a dozen times as France and England fought over St. Lucia's natural resources, notably the fine natural harbor at Castries. Today, the island retains some French and English influences, but Creole culture predominates. Nobel Prize-winning poet Derek Walcott is a national hero. The St. Lucia Jazz Festival is by far the biggest, most popular and well-known event on the island, but St. Lucia also has a lively Carnival celebration in February. Catholic feasts and holidays are celebrated year-round, and International Creole Day is marked in October with cultural events and demonstrations. St. Lucia isn't particularly known for its nightlife, but restaurants like The Lime keep the party going with The Late Lime, and the weekly Friday night Jump-Up at Gros Islet features home-cooked food and lots of beer and rum (an alternative is the Friday Night Fish Fry at Anse la Reye). Village rum bars are where the locals congregate. Indies and Folley at Rodney Bay Marina in Gros Islet are the best-known dance clubs.